Though the life and career of English writer, poet, and dramatist Oscar Wilde was short, his evocative, slyly humorous, and painfully human works live on. His skilled storytelling and characterizations and his willingness to take public stances on controversial issues have yet to be forgotten. As his story is retold and explored in the context of more modern sensibilities, he becomes increasingly endearing to new generations of fans. 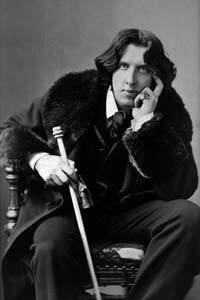 Oscar Wilde was the son of a Victorian era Renaissance man, William Wilde. By the age of 28, William Wilde had written two books, traveled the world, graduated as a doctor, and had been appointed as Medical Advisor to the Irish Census of 1841. His mother was a revolutionary Irish poet who wrote for a weekly Irish newspaper, The Nation. She also was a skilled linguist who translated a Gothic horror novel by Wilhelm Meinhold. So Oscar Wilde came by his courage and gifts through good genes. He was his mother’s second child, born Oscar Fingal O’Flahertie, on October 16, 1854. His sister, Emily, was born three years later, but tragically died at the age of 10. Oscar was deeply affected by his sister’s death and carried a lock of her hair with him for the rest of his life. Wilde excelled in school, first attending the Portora Royal School at Enniskillen, where he was awarded the school’s top academic prize for his achievements in studying the classics. He was awarded a scholarship to Trinity College in Dublin, where he again stood head and shoulders above the rest of the students, earning the highest award Trinity College could bestow and earning an invitation to study at Magdalen College, Oxford. Oscar Wilde graduated from Oxford and moved to London, where he published a book of poetry, aptly titled Poems, in 1881. His writing career was up and running. Later, in 1881, he left for America to give a series of lectures. During the busy lecture tour, he still found time to visit with such prominent American writers as Walt Whitman and Oliver Wendell Holmes, served as his own agent in arranging to have one of his plays staged in New York, and then retired to Paris to write a blank-verse tragedy commissioned by an American actress. When it was finished, however, Oscar Wilde’s work was rejected. Yet he remained undaunted and set off for a lecture tour throughout the British Isles and Ireland. In 1884, Wilde married Constance Lloyd, and they had two sons in quick succession. He took a job at a magazine to support his family, and then he embarked upon an extremely productive and creative period. He published two children’s stories, and in 1890, published his only novel, The Picture of Dorian Grey. His first play opened in 1892 to great critical and popular acclaim, and it was followed by three more highly successful plays, still beloved today. In 1891, Oscar Wilde met Lord Alfred “Bosie” Douglas. The two became lovers. However, Oscar was arrested in 1895, charged with gross indecency, and he served two years of hard labor. Meanwhile, his wife took their children and fled for Switzerland. Upon his release, he recounted his agonized prison term in the work The Ballad of Reading Gaol. But he could not rekindle his creative fires any further and spent the last years of his life shuffling around Europe, staying either with friends or in cheap hotels. A recurring ear infection flared up, leading to meningitis, and Oscar Wilde died on November 30, 1900.